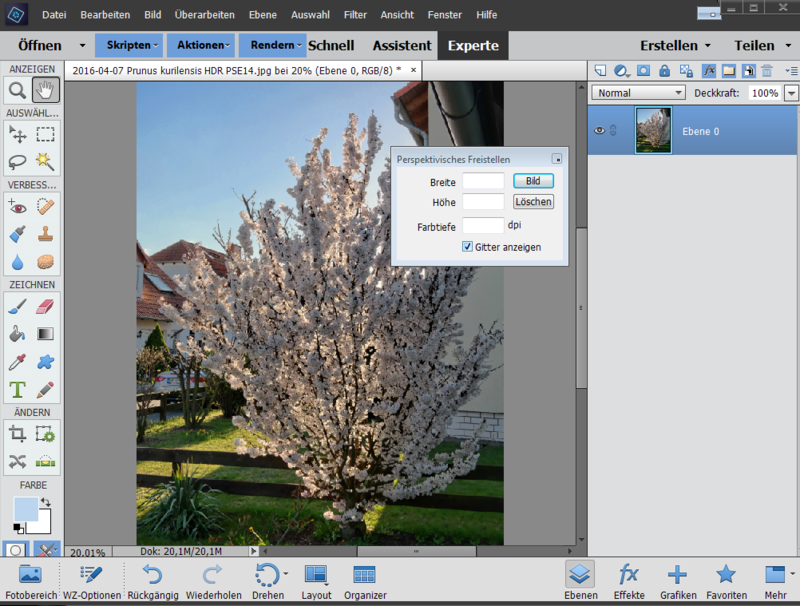 today I installed Elements XXL in Photoshop Elements 14. Unfortunately the Perspective cropping/morphing doesn't work. When I choose image - transform - perspective morphing or select perspective cropping in the tools palette, nothing happens. The settings window doesn't change. The manual says that I should draw a rectangle in order to start. But I don't know how to do this. 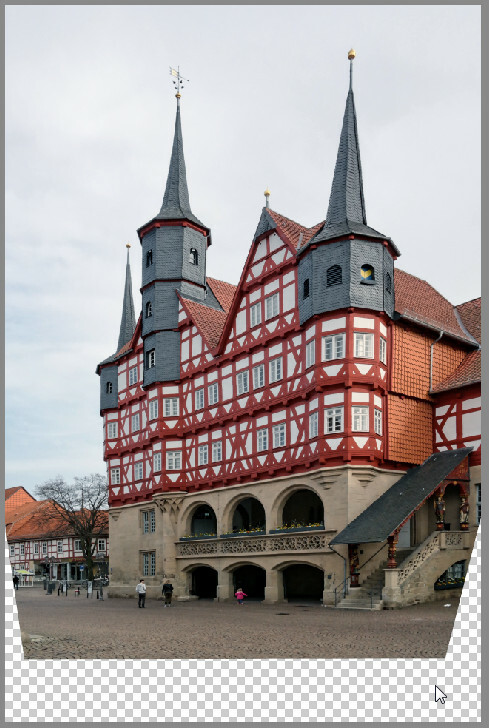 After you selected the Perspective Crop command or tool you should see a small Perspective Crop window. If it is not there than something went wrong. If it is there, you simply click on the image, hold down the left mouse button and move the mouse. This draws a rectangle with a grid on the image. Then you can move its corner handles to adjust it. To apply the effect you either hit the enter key or click on the green check mark icon. There seems to be a problem on your system. ElementsXXL places an invisible window over the image and the rectangle is drawn on it. A green checkmark and red cross are also displayed on this otherwise invisible window, but they are not visible in your screenshot. So the invisible window is probably not placed correctly. The blue rectangle in the top right corner could be the title bar of the misplaced invisible window, but it should not have a title bar, so something must have gone wrong. You seem to use Windows 7, but as the window title is not transparent, which may either be a chosen setting or indicate a graphics driver problem. Do you use a 1024x768 screen or did you only crop off the screenshot? Anything else that is special about your system? The Window "Perspektivisches Freistellen" should not have a button in the title bar. The button uses a strange symbol that I do not know, which is also visible in the top right blue rectangle. So it could also be that some other system software is manipulating the two windows of the perspective crop feature. What happens when you click on the strange button? You are right, I'm using Win 7 Home Premium. My resolution is full HD, 1920x1080, I cropped the screenshot. it's an additional button that minimizes the window into the tray. Actual Window Minimizer inserts this. The green checkmark and the red cross are visible in the original view but disappear in my screenshot tool (Ashampoo Snap). PS: I removed the strange symbol in the upper right by modifying the settings of the window minimizer but this didn't change anything. PPS: My graphics adapter is ADM Radeon HD 8570D. Well, maybe the symbol only attached to the PSE title bar and not the ElementsXXL invisible window. Anyway, try drawing the crop rectangle a bit above the green check mark. If that does not work, try deactivating the "window minimizer", run PSE again and try again. If it still does not work, something must be keeping the invisible window from getting the mouse input. I deactivated the autostart of the window minimizer and my screensthot tool (Ashampoo Snap 6) and restarted my computer. As expected the additional buttons are no longer visible. But still it's not possible to draw the rectangle and there is no grid visible. Can Elements XXL write a logfile? Does clicking on the green check mark or red cross work? Does the it exit the feature? Does the Esc key exit it? Yes, the green check mark and the red cross both work. And the escape key exits the tool too. So it seems that the fully transparent areas of the window get no mouse input. I only experienced this under XP so far. Maybe it has to do with your AMD graphics card. It works here with a Nvidia card. I will try to come up with a work around. That would be great if you could find a solution or a workaround. I would much appreciate if I could use this plugin. This problem only appeared under Win Vista and 7 and is now fixed in ElementsXXL 3.51. Unfortunately my trial period has exceeded now. I would like to be sure that it works on my computer now before I buy. Any solution? You have my guarantee. Otherwise I will refund your money. After morphing the image is shifted upwards: On top a region is cut off and on the bottom there is empty space. - Color balace (Farbbalance) is not in my local language (german). Is there a setting where the color temperatur (Farbtemperatur) can be adjusted (like in the RAW importer)? In my experience such a result only happens if you move the handles of the cropping grid outside the borders of the image. As there is no image data there, you get transparent areas in the result. If that was not the case, please show me a screenshot of the image with the cropping grid. Thanks for letting me know about the Color Balance localization problem. I will fix it today and send you an update. 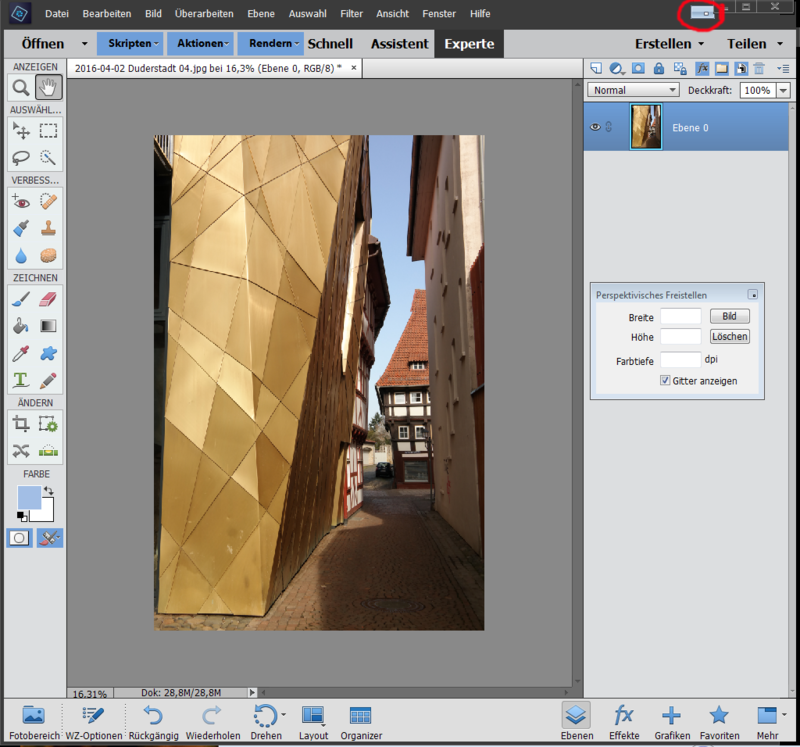 You have to save the image and open it again with File > Open in Camera Raw to adjust the color temperature. 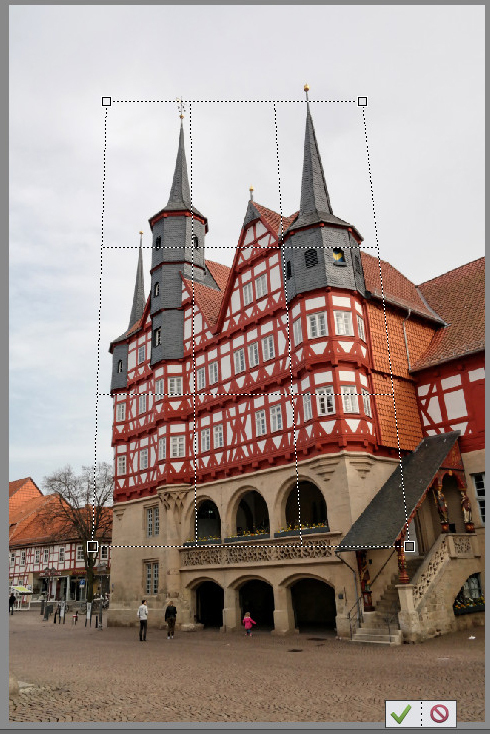 Our MetaRaw product offers a "Camera Raw Filter" feature, which lets you do that more conveniently. 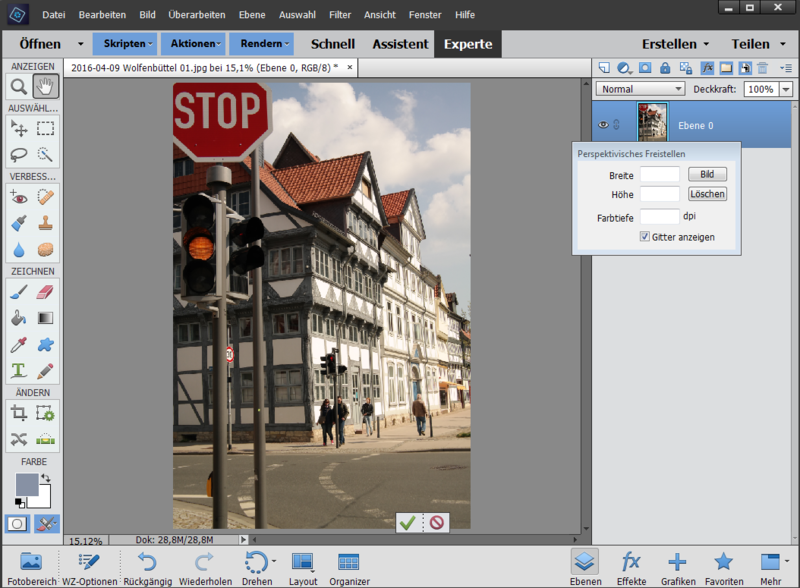 Maybe we will add a Color Temperature filter to Version 4 of ElementsXXL. I added it on the to-do list now. Right, I forgot: ElementsXXL cannot detect so far if there are rulers active. 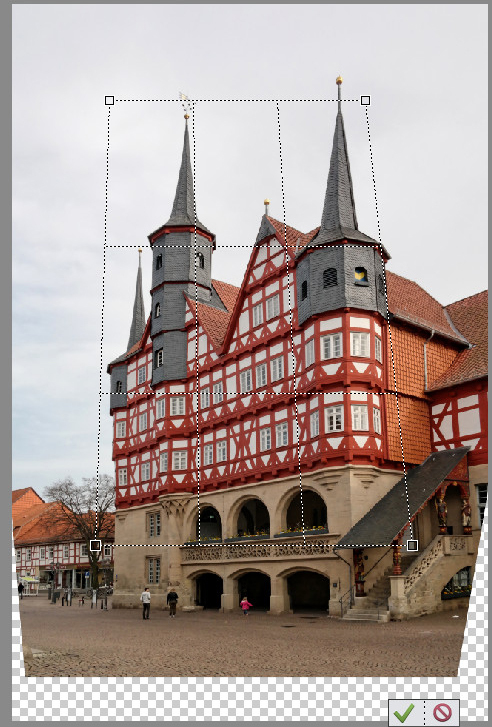 So to avoid the problem with the transparent cropping areas you have to deactivate rulers at View > Rulers (or in German: Ansicht > Lineale) at the moment. I will try to make ElementsXXL detect displayed rulers and adjust the coordinates of the cropping grid accordingly. Note that this was not perspective cropping but perspective morphing (Bild - Transformieren - Perspektivische Verformung). Ok, you mean Perspective Warp. Actually the transparent areas always occur with this feature. You have to manually crop the image yourself afterwards. Or alternatively use the Perspective Crop feature.